Get the most out of the summer, with this steel barbecue. 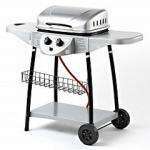 It features two gas burners, so you can really pack the full grill surface with delicious meat, fish, fruit and veg. Ideal for gardens or patios, the barbecue has two wheels so it's easy to move around. A fold-down lid helps keep food warm, and keeps the grill area clean during storage. Please note this barbecue is for use with propane gas (not included). Requires home assembly - tools required. How many burgers will it take? Does it have room to put lava rocks, or is it just the burners? Managed to get one from Godalming. Thank you.